During the course of the Civil War both sides accused each other of atrocities. The first year the conflicts were smaller and as a result the war produced very few prisoners. At this time, prisoner exchanges were not very common. This was because the Union refused to recognize the Confederacy. Then, in 1862 the size of the conflicts produced large numbers of prisoners on both sides. Then in July of 1862, both sides agreed to exchange soldiers according to rank. Under the terms of the agreement 1 general was worth 60 privates and so on. However, by 1863 the exchanges slowed down when more and more black soldiers entered the mix and the Confederates refused to trade. Another problem also quickly emerged as soon as the Confederate soldiers were released they returned to fight on the front lines. As the intensity and size of the war expanded the prisoner problem only got worse and before long there were 150 prisons in the North and South. All of them were overflowing with prisoners. Largely, the prisons were former factories, forts, or prisons. Living conditions in the prisons were bad on both sides, but food was always scarce in the South because of the implementation of the Anaconda Plan, a shipping blockade the effectively stopped all imports and exports in the South. There was however, no food shortage in the North. At this time the best prisons in the South were old tobacco drying and storage areas. 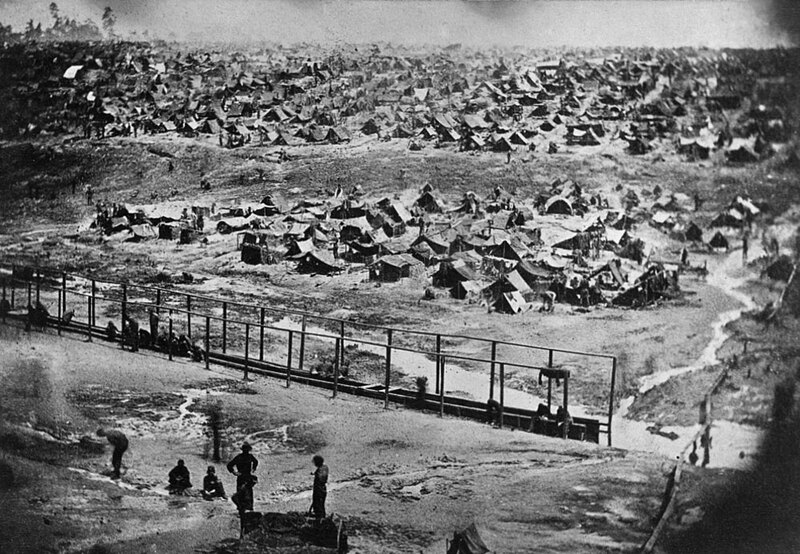 Then in 1863, there were so many prisoners in Richmond, Virginia, that the Confederacy chose to build a new, 16 acre prison outside of Andersonville, Georgia. Captain Henry Wirz was chosen to command the prison. Witz was medical doctor, who was a native of Switzerland. He had come to the United States in 1849. Wirz had been living in Louisiana when the war broke out and he soon enlisted in the Confederacy. A short time later he lost his right arm in combat. At this time he was removed from combat duty and placed in charge of the prison. However, before they could get started the size of the prison increased to 26 acres. This was so a stockade and a stream could be included. There were no tents or any kind of shelter. The prisoners lived exposed to the elements. The prison opened on February 24, 1864, when the first group of 600 men arrived. It was supposed to hold only 10,000 men, but it quickly swelled to almost 45,000. Andersonville soon earned a reputation for poor sanitary conditions, disease, overcrowding, and horrible food. The food that they did have was rotten and inedible. Largely, the menu was limited to cornmeal, beans, and peas. At the same time, the camp was overrun by scurvy, malaria, and dysentery. Almost all of it could have been avoided with basic sanitation, food, and shelter. In just a short time the stream soon proved to be inadequate because of the enormous numbers of prisoners. When the war ended in May of 1865, there were 12,912 Union prisoners officially buried in the cemetery at Andersonville. Most historians believe that the numbers are probably much higher. This is because many were buried in trenches in groups. At the conclusion of the war President Andrew Johnson had all the charges dropped against the Confederate officers. At this time there was an enormous public outcry for justice over the horrendous way the prisoners were treated in Andersonville. Subsequently, Captain Henry Wirz was tried and found guilty. He was hanged just four days later. Wirz was the only war criminal tried by the Union.